Find a quiet place to talk to your friend about your concerns. Tell him or her that you’re worried about the drug use. Point our ways in which the friend has changed, but don’t be accusatory or aggressive. Emphasize that you are worried about your friend’s health and safety. Be supportive and caring, not judgmental. Listen to what your friend says in return. He or she might know there is a problem, but not know what to do about it. Tell your friend that you’re there to help. Encourage your friend to talk to a trusted adult, such as parent, doctor, school counselor or nurse. Offer to go with your friend to talk to someone. 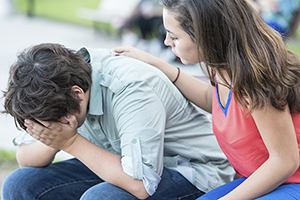 If your friend is not will to get help, talk to a trusted adult about the situation. Tell the adult that you think your friend is abusing drugs and needs help. Several anonymous resources exist to help people struggling with drug abuse.